Dr. Rebecca Darnell discusses grafting of elite Florida blueberry cultivars onto rootstocks of native wild blueberry relatives. Such innovations may bring new production efficiencies to the Florida blueberry industry. 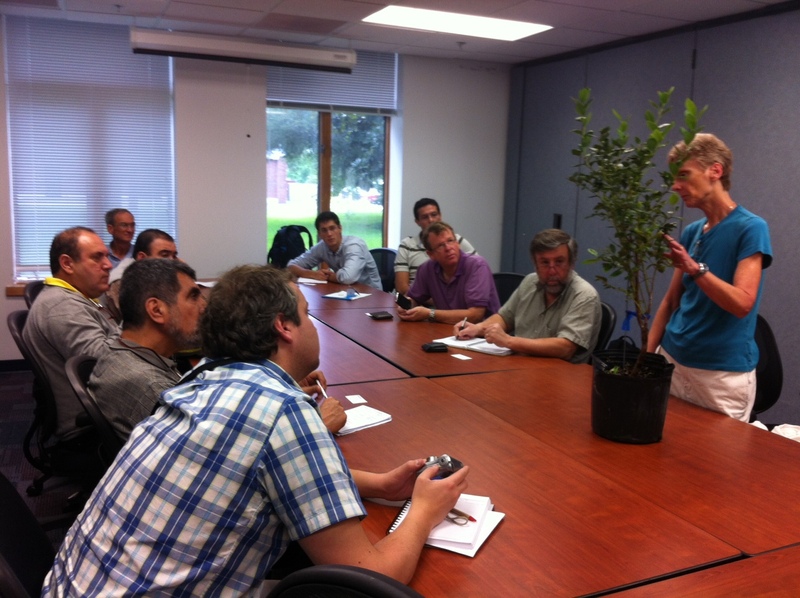 A delegation representing the Chilean blueberry industry and academic science visited the Horticultural Sciences Department to learn about Florida blueberries. Faculty in UF Hort Sciences have been instrumental in developing superior genetics and production techniques to meet the challenges of growing these high-value crops. The visitors from Chile expressed many of the same production problems we have here in Florida. Issues with the high cost of labor, product inconsistency and the need to extend post-harvest quality are some of the same pressures felt by growers here. Experts such as Dr. Rebecca Darnell, Dr. Jeff Williamson and Dr. Paul Lyrene offered some ideas from the cutting edge of research. The use of various varieties, innovations in mechanical harvesting, and even grafting to native Florida rootstocks were discussed. These new tools and techniques may be the foundation of improving fresh, nutritious fruit production in Chile, sharing what we’ve learned from blueberry studies here at UF.